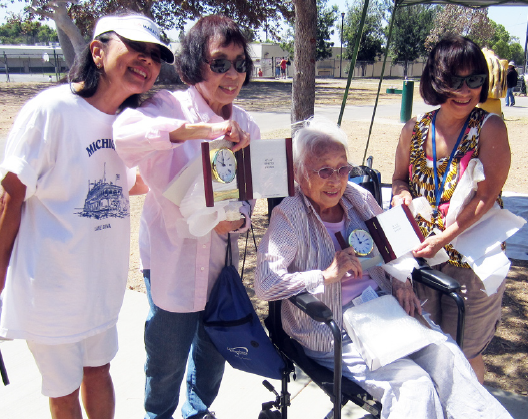 Chiyoko Ogawa (seated) is honored for turning 100 years old at the Nanka Shiga Club picnic. She is joined by (from left) Beverly Toyama, Nancy Kurihara-Johnson and Ann Gee. MONTEREY PARK — On Aug. 24, with the smell of marinated Korean beef in the air, the Nanka Shiga Club picnic was held at George Elder Park in Monterey Park. Utilized by the club for many years, the park had undergone a stunning renovation, and attendees were pleasantly surprised to see a brand new covered site that featured a large food preparation area, with sink and outdoor electrical outlets. The parking lot was also repaved. After Beverly Toyama, club co-chairperson, introduced the cabinet officers, then presented special gifts to two women who had attained 100 years of age: Chiyoko Ogawa and the late Mary Kurihara. Kurihara’s daughter, Nancy, accepted the gift for her mother. Family and friends all celebrated this momentous occasion. Toyama also presented a gift of appreciation to Mr. and Mrs. Toshihisa Enoki for their many years of leadership and dedication to the club. The scholarship chairperson, Seri Sekijima, and assistant, Katharina Miyoshi, announced the three recipients who proudly displayed their certificates. The winners are: Kai Kozai, a graduate of Cypress High School who will attend Cypress College; Michael Taheri, a graduate of Grover Cleveland High School who will enter Santa Clara University; and Mariea Sekijima, a graduate of Shurr High School who will enroll in Fordham University. The club is very proud of these young people and their strong ties to Nanka Shiga Club. Following a delicious picnic potluck lunch and encouraged by the warm sunshine and gentle breeze, adults and children enjoyed many games, including the ever-popular tug-of-war, the three-legged run, and water balloon toss. Finally, dancers formed a circle to dance to Shiga’s “Goshu Ondo” and other popular odori numbers. 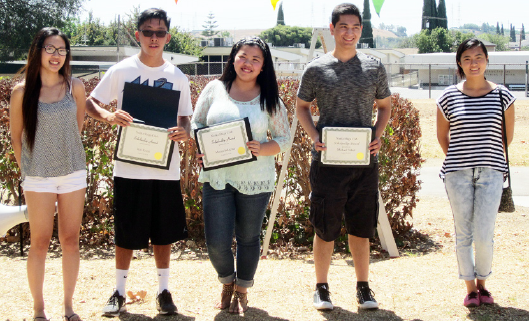 Nanka Shiga Club scholarship awardees. Please tell me what Nanka Shiga means. Nanka means Southern California. Shiga is a prefecture (ken) in Japan.